The author is an agriculture and natural resources program assistant for Ohio State University Extension in Fairfield County. During the ‘60s, it seemed the highlight of early spring for a farm boy in small town Ohio was planting oats. I know that may not sound exciting these days, but consider that as early as soil conditions would permit, I got at least one day — and probably two — out of school in order to plow and work ground for planting oats. The goal then was to get the oats planted as early as possible so that they would outgrow the annual weeds. We planted a small field of oats every year for several reasons. Foremost, we used oats in the feed rations for the dairy, the sow’s ration, the beef feedlot, and the henhouse. Back then, we didn’t buy it if we could grow it. Oats also made nice bright straw. Most of the time we were also starting a new hayfield by underseeding our perennial forage at the same time we planted oats. Today, I’m hard pressed to find a spring-seeded oat field anywhere in central Ohio. I suspect it’s the same across the Midwest. Oats don’t produce enough volume of grain today to compete on a profit basis with feed grains like corn. And since much of the straw these days is used by landscapers, seeding contractors, or as dairy feed, wheat or rye straw yields more and works very nicely. All that said, oats still own a place in the rotation for those who appreciate them solely as a forage crop. Around the turn of this century, cover crops were gaining attention at about the same time intensified grazing management was growing quickly in popularity. For many of us in Ohio, that’s about the time when the oats Grandpa used to grow became a forage crop. Here’s what has been most surprising: When planting oats after the summer solstice, we’ve discovered that with only a modest amount of management, oats provide more total tonnage than we often get from our perennial mixed forage hayfields. Further, we also find that oats can be utilized very nicely in a managed grazing system. Oats can be planted following a wheat harvest or perhaps on failed corn or soybean acres. 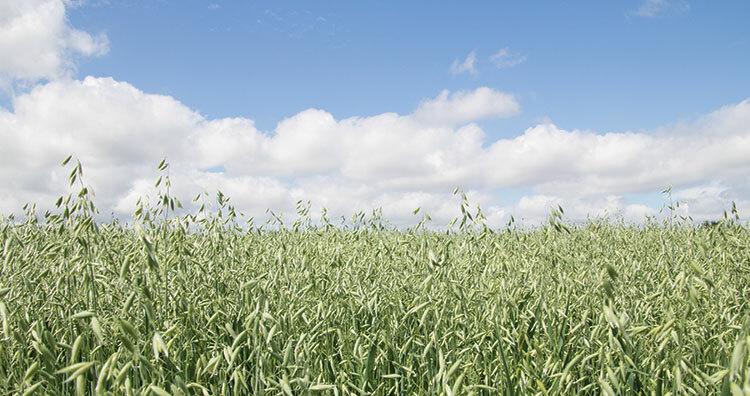 If there’s a need for additional forage, oats are a low-cost yet high-quality feed alternative that can be either mechanically harvested or grazed. In fact, if planted most any time in July or August, we know there’s an opportunity to produce anywhere from 2 to 5 tons of forage on a dry matter basis, investing little more than the cost of 80 to 100 pounds of spring oats seed and 40 pounds of nitrogen. Over the years, we’ve found it’s not important to rush to get the oats planted as soon as possible after wheat harvest. In fact, our experience in central Ohio has been that we get a greater yield and higher quality feed if we wait until the end of July or very early August. Oats prefer the cooler average daily temperatures we typically experience beginning in August, plus they are more likely not to push out a seedhead but remain vegetative until extremely cold temperatures shut them down completely sometime in December. Not only does an August 1 planting date seem to offer more yield and higher quality oat forage, but it also allows ample time to complete wheat harvest, haul manure, and control any perennial weeds and volunteer wheat that might be present. Considering the concerns throughout our state for marestail, the time and effort spent post wheat harvest and before oat planting is valuable for controlling this and other biennial weeds, too. Regardless of the planting date, or oat variety, no-till seeding rates from 80 to 100 pounds of spring oats have consistently resulted in optimum forage yields. Our optimum nitrogen application rate has been 40 to 50 pounds per acre. Higher rates of nitrogen have actually depressed yields in some of our demonstration plots. The optimum combination of productivity and quality of August-planted oats typically arrives 60 to 75 days after planting. Apparently due to the heat, oats planted in July mature more quickly and in most years have rapidly declined in quality beginning 50 to 60 days after planting. We’ve also found that oats harvested 50 to 60 days after planting and while still in the boot stage of maturity may offer some regrowth that could be grazed. For a forage oat harvest beginning in November, grazing provides the most effective and affordable option. We’ve had a local grower strip-graze oats all winter and actually begin the calving season on them before he ran out of oats in mid-March. Dry baling oats in the fall has been done, but it’s a challenge considering that once cut, oats will dry slower than mixed grass hay. Cut in November, it typically means at least two weeks or likely more of drying time will be required to make dry hay. Wet wrapping is an effective yet expensive alternative. Oats won’t die until temperatures have been in the mid-20s for several hours. That means they’ll still be green and alive most years in December throughout central and southern Ohio. If grazing the standing oats is not an option, chopping and ensiling oats is another alternative for harvest. Chopped forages are more digestible than long-stem forages and fit easily into a variety of ration types. An additional advantage observed when using oats for an annual forage crop is the opportunity to capture the total tonnage produced with a single harvest. Oats planted beyond early July won’t get a young farmer out of the classroom, but these aren’t your grandpa’s oats . . . they’ve now become a high-quality and very productive forage crop! This article appeared in the August/September 2017 issue of Hay & Forage Grower on page 30.